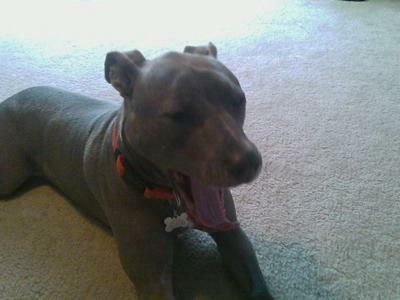 Silas is a 22 month old blue Pitbull Terrier. I got Silas second hand from another owner, but I knew that he was a wonderful dog the moment that I saw him! I brought my 8 pound chihuahua with when I went to look at Silas. My chihuahua put Silas in check within the first 30 seconds. She growled and charged at him. From that point on Silas knew that she was the king of the house. Silas loves to stand on the window sill and watch people walk by. He loves to roll around on his back and dig holes in the yard. He is very active and can run for hours at a time with out tiring out. He loves to play fetch with anything you will throw at him. He knows when we are going to the dog park, he darts out to the garage and waits at the passenger door of the car to jump in. Silas is a very sweet dog, he loves to love people and animals. We like going to the dog park, he gets to check out all the other dogs, play around and run as much as he wants to.